If you’re away from home and using a Mac laptop and you want to retrieve a file from the hard drive of your Mac at home, you’re in luck — if you’re a MobileMe member. You can exploit Back to My Mac, a feature that lets you remotely connect to your Leopard-based computer from another Mac with Leopard. 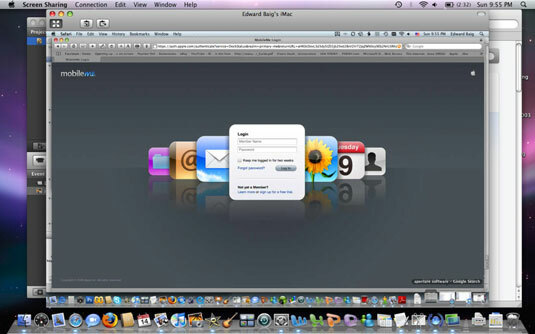 To connect to your home Mac: Choose MobileMe under System Preferences and click the Back to My Mac tab. Click the Start button shown in the figure. Repeat this procedure on all the machines you want to access; they must share the same MobileMe account. If you have a router, you might have to open ports in your firewall for Back to My Mac to work in all its remote computing glory. To locate the file you want on your home Mac: Click that home Mac (under Shared) in Finder and browse its hard drive for the file you need. Drag the file to the desktop of the computer you’re using for remote access. 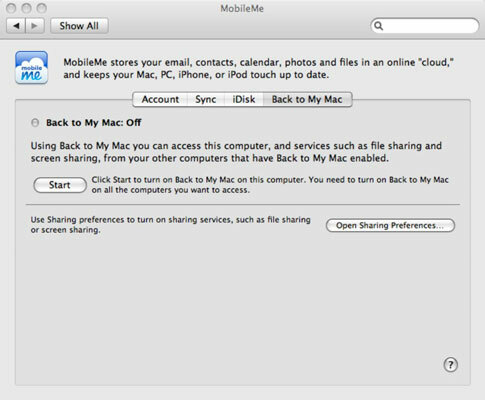 To share and control your home screen remotely by clicking Share Screen in Finder: Before you leave on your trip, remember to select the Screen Sharing option, found when you click Open Sharing Preferences under MobileMe preferences.